Those who know where they come from know where they need to go. 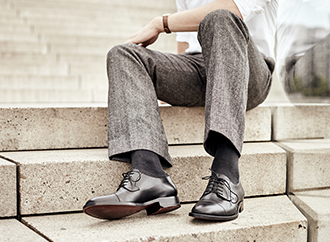 Heinrich Dinkelacker had a dream: of a sophisticated, elegant and long-lasting premium shoe. But back in 1879, when the company founder first opened the doors to his own shoe business in the tranquil German town of Sindelfingen, he would have been extremely hard-pressed to imagine that he was laying the groundwork for a shoemaking tradition that would go on for centuries to come. The Heinrich Dinkelacker brand continues to represent handcrafted, premium shoes that suit the most demanding tastes to this very day. The location of the former company headquarters was no accident. At the time of the company’s founding, the small city of Sindelfingen, located in the German state of Baden-Württemberg, was not only a renowned centre of hand weaving, but also counted some of the best shoemakers in Germany among its inhabitants. As is to be expected, much has changed since the company was founded at the turn of the 19th century. The current company headquarters in Bietigheim-Bissingen now combines a storied handcrafting tradition with modern, value-oriented management. That being said, the underlying premise remains the same as it was at the company’s outset: creating charming, long-lasting men’s shoes representing the pinnacle of handcrafted perfection. In the early 2000s, Heinrich Dinkelacker reached a further milestone in its history. In 2004, when the company, which was previously family-owned, found itself without an heir among its ranks, the three shoe lovers Dr Wendelin Wiedeking (the former CEO of Porsche AG), Norbert Lehmann (a former IBM Manager) and Anton Hunger (the former Head of PR at Porsche AG) stepped in and took over the company leadership. A passion for Heinrich Dinkelacker shoes drove them to commit tot he brand; each new owner had been a devoted fan for decades. The trio consciously chose to avoid introducing any sort of automation, process optimisation or mass production. Instead, they focused on establishing an international presence for the traditional luxury shoes. Heinrich Dinkelacker’s extraordinary commitment to exclusive quality was reinforced when the company took the ‘Brand of the Century’ prize in 2015. Moving the Heinrich Dinkelacker factory in the 1960s proved to be both an historic and a forward-looking decision. Since that time, the company’s masterful production has been based in one of the oldest European factories, in Budapest. Back then, the Hungarian metropolis was already considered the world capital of shoemaking craftsmanship, whereas the sophisticated shoemaker’s guild in Germany was hindered by a lack of new recruits. The relocation to Budapest has proven to be a wise decision, and is an important element of ensuring the uniquely high quality of classic Dinkelacker masterpieces. Heinrich Dinkelacker further evolved in the fall of 2016 through its merger with Shoepassion GmbH. The Berlin-based shoe brand had been offering its own collection of Goodyear-welted, full-leather shoes for men and women as well as sophisticated accessories since the beginning of 2010, and initially operated exclusively online. In the intervening years, the once purely online player has established its own brick-and-mortar retail locations in all major German cities as well as several European capitals. The historic merger of one of the oldest German shoe brands with one of the youngest united classic craftsmanship with 21st-century digital savvy. As such, Heinrich Dinkelacker is perfectly equipped for the future of retail.